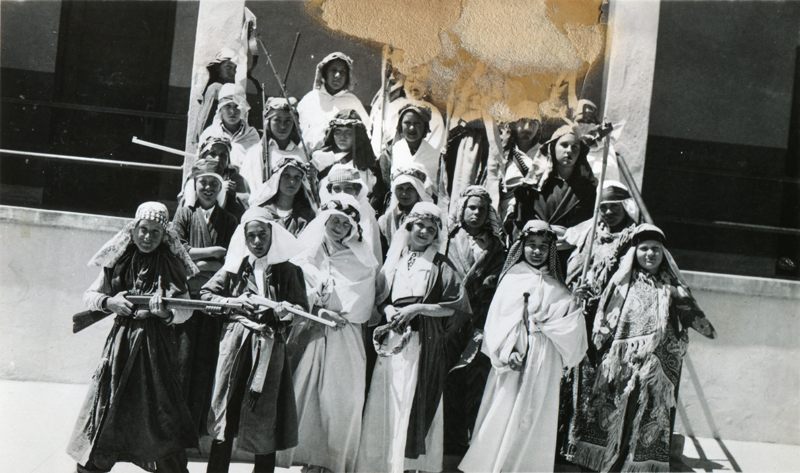 Photo contributor Patricia Bennett (nee Patricia Pearl Cook), at lower right, wearing what appears to be a floor rug, has identified this photograph as "Arabian Nights." No date; probably ~1937. 3x5-inch glossy print, damaged by a corrosive substance. Judging from this and other photos, plays were popular forms of amusements for school children in the 1930s. "Arabian Nights" is the English name for what was originally "One Thousand and One Nights," a collection of folk tales compiled in Arabic. Europeans expanded it to include stories such as Aladdin and the Magic Lamp, Ali Baba and the Forty Thieves, and the Seven Voyages of Sinbad. This is the fourth iteration of the K-8 Newhall School, built in 1928 at what is now 24607 Walnut Street. (The first burned down, the second met an uncertain fate and the third was outgrown). The fourth school burned down in February 1939 — just prior to Patricia Cook's June 1939 graduation from the eighth grade — and was rebuilt in place. PC3702: 19200 dpi jpeg from original photograph donated 2003 by Patricia Bennett (nee Patricia Pearl Cook) of Carpinteria.